The Nkwe ya Selefera - Silver Leopard, post-nominal letters NS, was instituted by the President of the Republic of South Africa on 16 April 2003 and came into effect on 27 April 2003. It is South Africa's second highest military decoration for bravery. The iPhrothiya yeBhronzi - Bronze Protea, post-nominal letters PB, was instituted by the President of the Republic of South Africa on 16 April 2003 and came into effect on 27 April 2003. It can be awarded to all ranks who have distinguished themselves by leadership or meritorious service and devotion to duty. The Honoris Crux Gold, post-nominal letters HCG, is a South African military decoration for bravery which was instituted in 1975. It was awarded to members of the South African Defence Force for outstanding acts of bravery while in extreme danger. It was the second most senior in a set of four classes of Honoris Crux decorations which replaced the discontinued Honoris Crux of 1952. The Pro Virtute Decoration, post-nominal letters PVD, is a military decoration for bravery which was instituted by the Republic of South Africa in 1987. It was awarded to officers of the South African Defence Force for distinguished conduct and exceptional leadership during combat operations in the field. The Medical Service Cross, post-nominal letters CC, is a military decoration which was instituted by the Republic of South Africa in 1987. It was awarded to members of the South African Medical Service for bravery. 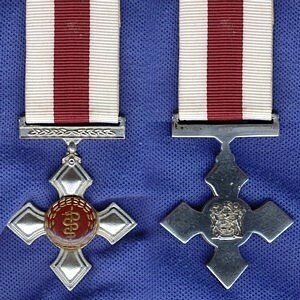 The Medical Service Cross was discontinued in 2003, but backdated awards can still be made for acts of bravery during this period. The Star of South Africa, Gold, post-nominal letters SSA, is the senior decoration of two military and five non-military classes of the Order of the Star of South Africa, a South African Order which was instituted in 1975, for award to general and flag officers of the South African Defence Force. The Order of the Star of South Africa was discontinued in 2002. The General Service Medal was instituted by the State President of the Republic of Bophuthatswana in 1991, for award to all ranks for operational service inside Bophuthatswana. The Nkwe Medal was instituted by the State President of the Republic of Bophuthatswana in 1990, for award to all ranks for operational service. The Distinguished Gallantry Medal was instituted by the State President of the Republic of Bophuthatswana in 1982, for award to all ranks for extraordinary gallantry. The Star for Bravery in Gold, post-nominal letters SBG, was instituted by the President of the Republic of South Africa in April 1996. It was awarded to veteran cadres of Umkhonto we Sizwe, the military wing of the African National Congress, who have distinguished themselves during the "struggle" by performing acts of exceptional bravery in great danger. The Star for Bravery in Silver, post-nominal letters SBS, was instituted by the President of the Republic of South Africa in April 1996. It was awarded to veteran cadres of Umkhonto we Sizwe, the military wing of the African National Congress, who had distinguished themselves during the "struggle" by performing acts of bravery. The Service Medal in Silver was instituted by the President of the Republic of South Africa in April 1996. It was awarded to veteran cadres of Umkhonto we Sizwe, the military wing of the African National Congress, for twenty years service. The Gold Star for Bravery, post-nominal letters GSB, was instituted by the President of the Republic of South Africa in April 1996. It was awarded to veteran cadres of the Azanian People's Liberation Army, the military wing of the Pan Africanist Congress, who had distinguished themselves during the "struggle" by performing acts of exceptional bravery in great danger. The Bravery Star in Silver, post-nominal letters BSS, was instituted by the President of the Republic of South Africa in April 1996. It was awarded to veteran cadres of the Azanian People's Liberation Army, the military wing of the Pan Africanist Congress, who had distinguished themselves during "the struggle" by performing acts of bravery. The Bronze Medal for Merit, post-nominal letters BMM, was instituted by the President of the Republic of South Africa in April 1996. It was awarded to veteran cadres of the Azanian People's Liberation Army, the military wing of the Pan Africanist Congress, for service of a high order during the "struggle".